The Hotel Patagonia offers modern, spacious and cosy accommodation at the top of Arinsal Village, 800m from the centre of resort. 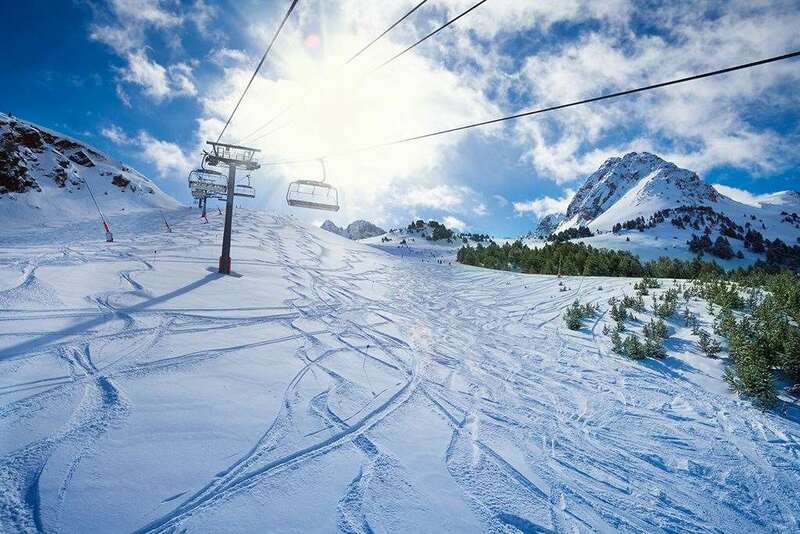 Ideally situated for the slopes, only 30m from an express chairlift that offers direct access to main Arinsal ski area. The free ski bus to the main gondola also stops outside the hotel. Rooms 2-4 people: Comfortable bedrooms with twin beds and two sofa beds, cable TV, balcony, bathroom with bath, shower & wc and small kitchenette (charge for use and payable locally). Rooms for sole use available at a supplement and on request. We stayed at the Hotel Patagonia at the beginning of January 2016. The hotel is at the top of the village, right next to (less than 50m from) the chair lift which takes you to the main ski area. It does seem to be less sociable, as the other hotels down the hill are right next to the bars, restaurants and pubs. However they are all next to the Gondola, whereas being next to the chair lift is so much easier! It is a fair 15 minute walk up and down the hill to the village which has lots of bars, pubs, an Irish Bar, restaurants and a shop. There is a free bus which goes up and down the hill (it's a bit of an uphill trek!) The hotel itself is lovely. Friendly, English speaking reception staff, clean, spacious rooms with twin beds, a sofa, and table and chairs. There is a mini kitchen area with a microwave, fridge and hob but I think you have to pay extra (we did put drinks in the fridge though). The food was brilliant. We paid for Half Board and there was a full buffet for both breakfast and evening meals. The evening meals don't include drinks unless you pay for them (orange juice and hot drinks are available for free at breakfast). I have read lots of reviews that the restaurant staff were rude - this is not the case! They just don't speak English, and really appreciate it when you try and speak Spanish to them. The lounge area downstairs was very cosy with a log fire and comfy sofas. There are some evening entertainments but a pack of cards suited us fine. There are activities for children. There is a 'fitness suite' but it is very basic, and the sauna was 12 Euros for 30 minutes. There is a bar downstairs that did delicious cocktails (Fresa Mojito was a personal favourite!) A nice touch was hot soup and mulled wine for free in the entrance to the hotel after a long day ski-ing. The ski-ing area is fine for a beginner - intermediate skier. I have been ski-ing for over 15 years but it was fine for me as I went with beginners. If I went with experienced skiers I would probably go to a larger area. The snow coverage was fine, we had a fresh 'dump' of snow on the second day. The staff at the ski hire shop said the quietest week to go is the second week in January, as this is when the Spanish children go back to school. Great value for money, food and drinks in the mountains was extremely reasonable. Everyone is very friendly, all in all a great holiday!